Kim Jong Un, Chairman of the Workers’ Party of Korea, Chairman of the State Affairs Commission of the DPRK and Supreme Commander of the Korean People’s Army, inspected the construction site of the Orangchon Power Station. The Orangchon Power Station construction project was started by the instruction President Kim Il Sunggave on June 5 1981 and dam-style units 3 and 4 are to be built up the Orang River and units 1, 2 and 5 in the form of waterway by constructing the Phalhyang dam downstream, in order to create a total power generating capacity of 134 000 kW. 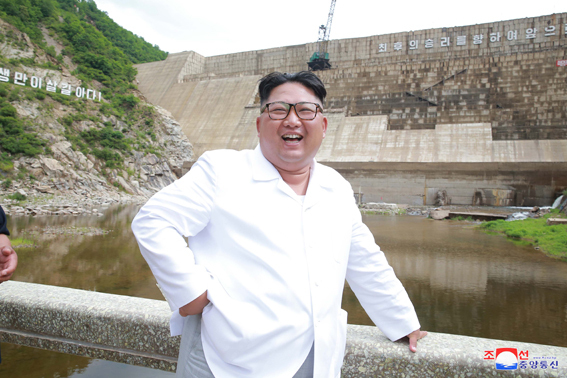 The first leg of his inspection tour was the construction site of the Phalhyang dam. He said that when the Orangchon Power Station is constructed, it would make a tangible contribution to promoting economic growth and the people’s livelihood in North Hamgyong Province on which industries are concentrated. He took revolutionary measures to complete the project by October 10 next year by giving an instruction to the Party Central Committee to mobilize all Party organizations and its members and take charge of, organize and guide not only the construction of dams but also the project as a whole. He looked round Orangchon Power Station Unit 5. Electric power industry is the lifeline and heart of the national economy, he said, stressing the need again to carry out the construction project by directing all-Party and nationwide efforts to it. He spoke highly of the builders for having done a lot of work by devoting their pure conscience despite the difficult conditions of the country without caring about whether they are appreciated or not, and ardently appealed to the whole country to turn out resolutely in the general offensive, breathing the same breath with the builders of the Orangchon Power Station.